Ordering available only within the U.S.
* Children Who Glorify God. Are you confused about your responsibilities as a mother? Are there not enough hours in the day to get everything done? When you tuck your children into bed at night, do you have regrets? Knowing deep down in our hearts that children are gifts from God gives many of us reason to feel guilty about not making the most of our time with the children God gave us. We get so busy making school lunches, driving car pools, doing homework, and trying to keep our homes clean enough to find a path to the door that we don’t know if we are coming or going. We are trying the best we know how to make the most of each day, yet we always seem to fall short of our goals. Most of us don’t think of time with eternity in mind. We think of not having enough time to do all he things we feel we want to do. “I just need more hours in the day!” laments many an overburdened mother. 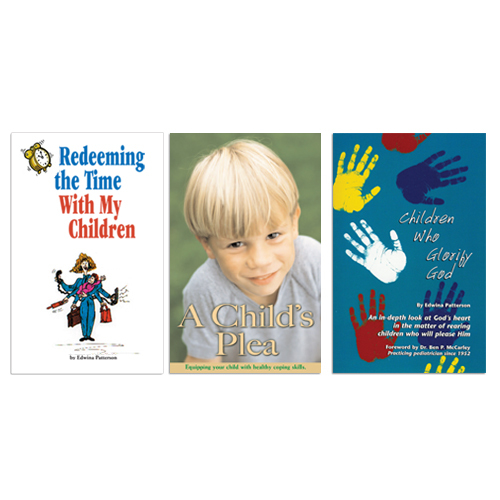 Redeeming the Time With My Children offers parents hope and practical suggestions from a woman who has walked in their shoes. This book will encourage you to begin today to buy back wasted opportunities and redeem the time with your children. Times have changed since you were a child. And for most children today – whether they’re ready for it or not – stress is a fact of life. Today’s children must learn more, compete more, cope with more temptations, and work harder than at any time in history to achieve the bare essentials of life. We have created the hurried household that produces the hurried child. And the effect on our complex, ever-changing, hectic world is often beyond the coping capacity of our children.